Fog Mountain sounds intriguing! This Chinese green tea is grown in the high mountainous regions of Yunnan province China know for some very famous quality green teas. Medium sized uniform wiry green leaves with ample silver buds and a little open leaf characterizes this excellent choice for a moderately priced organically grown green tea. What our customers and I appreciate about this tea is its ability to withstand incorrect steeping to a significant degree. All of us ‘Steepers’ make errors from time to time with water too hot, steeping too long and end up throwing good green tea away because we messed up. I have steeped Fog Mountain for 30 minutes and drank it. Despite the long time under water it was not that bad and really surprised me. Yunnan greens may be pan-fired or otherwise oxidized slightly thus giving them the ability to steep under more diverse conditions. Once we discovered this we began to promote it as a ‘user-friendly’ Chinese green tea. 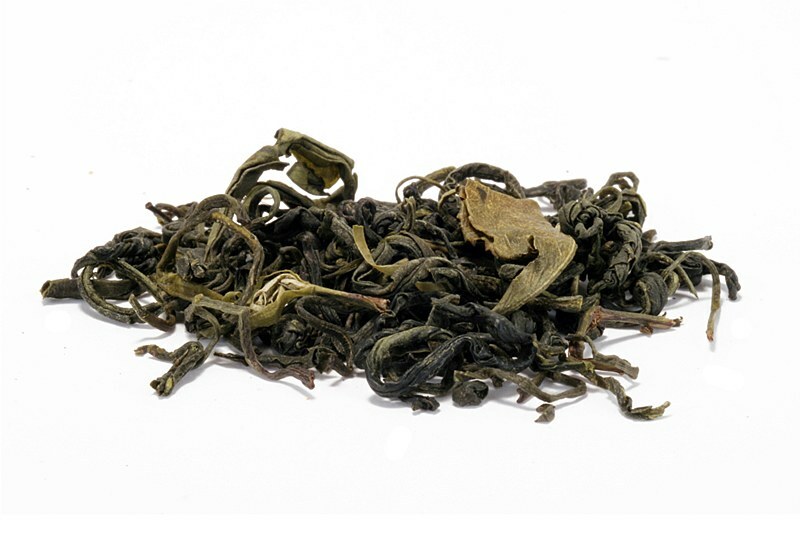 Fog Mountain caught on and quickly became our best-selling Chinese green tea. As a bonus Fog mountain has a very appealing taste to most North American tea drinkers, especially the ‘new to green tea’ or first timers. Every tea shop needs a tea like this! So many tea buyers are turned off of green tea because they purchase the wrong green teas for their tastes. These sweet aromatic leaves infuse to produce a soft, smooth and mellow tasting green tea with prominent apricot and plum-like notes and gives at least 3 enjoyable infusions. Come on into our store and talk to us about why this may be the green tea for you. We will give you a sample to see if Organic Fog Mountain should be in your tea cupboard. Organic China green tea. An excellent tea with dark green leaf and an aromatic sweet taste. The perfect introduction to enjoy Chinese green tea.